For many non-Catholics, devotion to Mary is odd at best, weird, frightening, and down-right pagan at worst. Such titles freely given her by the Church as “Mother of God” and “Queen of Heaven” can be off putting, indeed, leading certain Protestant clerics to refer to Catholicism as utterly un-Christian. The truth of the matter, however, is that devotion to Mary is not only deeply rooted in Scripture, there can be no real Christianity without it. Presuming that one accepts that the events of the life of Christ as recorded in the Bible are true, from the moment that the Archangel St. Gabriel announced to Mary that she would bear the Son of God, she herself was aware of what this would mean — knowing that all who accepted her Divine Son would revere her as well, that is, call her “blessed.” Her cousin Elizabeth realized this as well, as did her unborn son, St. John the Baptist. During the course of Christ’s ministry, His Mother was always close beside; indeed, He performed His first miracle at her behest, at the marriage feast at Cana. She was by His side at the Crucifixion, and granted by Him there as foster Mother to St. John and the Church. But in a few centuries heresy, having attacked the Divinity of Christ in Arianism, attacked Mary’s right to be addressed as Mother of God in Nestorianism. Where the orthodox teaching saw Christ as one individual with two natures, human and Divine, Nestorius saw Christ as having two persons within Him — of which Mary was mother solely of the human. Hence he conceded to her the title “Mother of Christ,” but no more. His views were condemned by the Ecumenical Council of Ephesus in 431: “If anyone does not confess that the Emmanuel (Christ) in truth is God and that on this account the Holy Virgin is the Mother of God (Theotokos) in as much as she gave birth to the Word of God made flesh…let him be anathema” (Council of Ephesus, DS 113). From that time until the Protestant Revolt, schisms and heresies rent the Church. But none (save those like the Albigenses, who also attacked the Incarnation of Christ) ever attacked the position of the Mother of God in the Church, nor the devotion due her. That would wait until the so-called “reformers” of the 16th century. But they did not deny most Marian doctrines, such as the Perpetual Virginity and Immaculate Conception of the Virgin. Luther, for example, happily called her the Mother of God: “She is rightly called not only the mother of the man, but also the Mother of God … It is certain that Mary is the Mother of the real and true God” (Martin Luther, Weimar edition of Martin Luther’s Works, English translation edited by J. Pelikan [Concordia: St. Louis], volume 24, 107). He also defended the Immaculate Conception: “But the other conception, namely the infusion of the soul, it is piously and suitably believed, was without any sin, so that while the soul was being infused, she would at the same time be cleansed from original sin and adorned with the gifts of God to receive the holy soul thus infused. And thus, in the very moment in which she began to live, she was without all sin…” (Op. Cit., Volume 4, 694). Calvin and Zwingli made similar comments. But in rejecting her intercession, however (as they did that of all human beings — that is, the Saints), they laid the foundation for subsequent Protestants to ignore her completely. In time, this became outright rejection. This is really too bad, because the fact is that devotion to Mary is all bound up with her Divine Son’s Incarnation. It is from Him that she derives her unique role; denial of that role cannot help but be an attack upon its source. But a great deal of opposition to Marian devotion comes, not from reason, but mere anti-Catholicism; as that has waned to some degree, a number of Protestants are rediscovering the Mother of God. Modern Christian opposition to Mary comes from several sources. The first is the fear that reverence to her detracts from the worship due Almighty God. Traditionally, however, the Catholic Church has differentiated between latria, the worship due to God alone, and dulia, the reverence offered the Saints (that given Mary, due to her unique nature, is termed “hyper-dulia”). An insight into this issue, however, was given this writer by the late Bill Zuk, a convert from Protestantism. “When Protestants accuse Catholics of ‘worshipping’ Mary they are, in a sense, correct. Catholics honor Mary, they pray to her for her intercession with God, they try to emulate her. All of this is how most Protestants deal with Jesus. Our Sacramental worship of Him is completely beyond them.” That this observation has some merit is borne out by the fact that Churches with the same sacramental system as the Catholics, such as the Orthodox, equal Catholics in their veneration of the Virgin. Moreover, those elements of Anglicanism, Lutheranism, and Calvinism that have rediscovered the idea of the Sacraments (regardless of whether or not they actually have them) generally revive Marian devotion as well. (See the section on Mary and ecumenism). But what of the title, “Queen of Heaven?” We have dealt with this question at length in another section (see QUEENSHIP OF MARY). But it would be good to recall the words of Pius XII: “…the main principle on which the royal dignity of Mary rests is without doubt her Divine Motherhood. In Holy Writ, concerning the Son whom Mary will conceive, We read this sentence: ‘He shall be called the Son of the most High, and the Lord God shall give unto him the throne of David his father, and he shall reign in the house of Jacob forever, and of his kingdom there will be no end,’ and in addition Mary is called ‘Mother of the Lord’; from this it is easily concluded that she is a Queen, since she bore a son who, at the very moment of His conception, because of the hypostatic union of the human nature with the Word, was also as man King and Lord of all things. So with complete justice St. John Damascene could write: ‘When she became Mother of the Creator, she truly became Queen of every creature’” (Ad caeli reginam 34). From the earliest times, Christians, East and West, referred to the Virgin as “Spotless” (achrantos); as early as 5th century Syria a feast in honor of her Spotless Conception was celebrated, which made its way throughout the East and eventually to the West. Even the Muslims accepted the Immaculate Conception of Mary — ironic, given that they held no such belief about Mohammed’s mother. 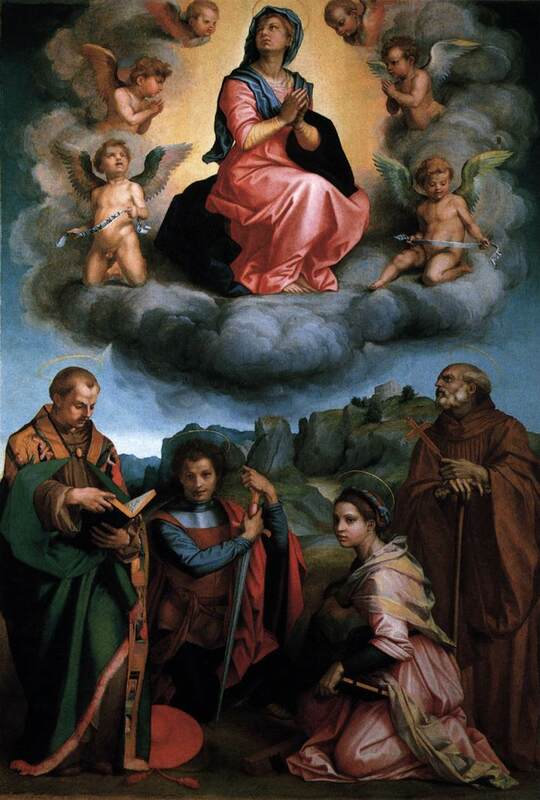 What of the bodily Assumption of the Virgin Mary into Heaven? This too has its roots in the earliest days of the Faith. Although there is not so much in the way of scriptural proof of the dogma as there is for the Immaculate Conception, those who hold to the Scripture Only theory should recall that prior to the Church’s official closing of the Canon at Carthage in 397, far more weight was given to the Church’s unbroken Tradition than to purely scriptural references — after all, the Canon itself is a product of that Tradition. In any case many of the books rejected for inclusion in the Bible at that Council contain references to the Assumption; while not authoritative in themselves, here as in so many other places these writings do bear witness to what the earliest Christians believed. Certainly, the developing Liturgy also gave witness to the belief — itself a logical necessity of the Immaculate Conception. The decay of the body being a result of Original Sin, how could it touch her who was spotless? On November 1, 1950, Pius XIII issued the Apostolic Constitution Munificentissimus Deus. As his predecessor had done with the Immaculate Conception, Pius adduced the proofs in favor of the doctrine, and then defined: “we pronounce, declare, and define it to be a divinely revealed dogma: that the Immaculate Mother of God, the ever Virgin Mary, having completed the course of her earthly life, was assumed body and soul into heavenly glory.” There she remains today, interceding for us with her Divine Son, reigning as Queen of Heaven and Earth, and shedding graces and protection upon the faithful who invoke her. Now as ever, to deny her, is to deny her Son.